Great video of the start, courtesy of Troy Morgan. Thanks for sharing Troy!Can you spot yourself? 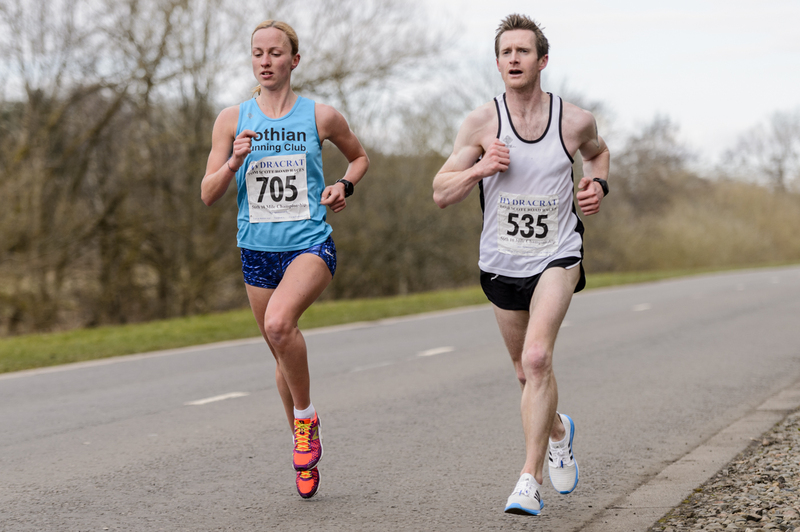 Luke Traynor and Sarah Inglis set course records as they claimed the Scottish 10-Mile titles at the 56th Tom Scott Memorial Road Races, sponsored by Hydracrat. 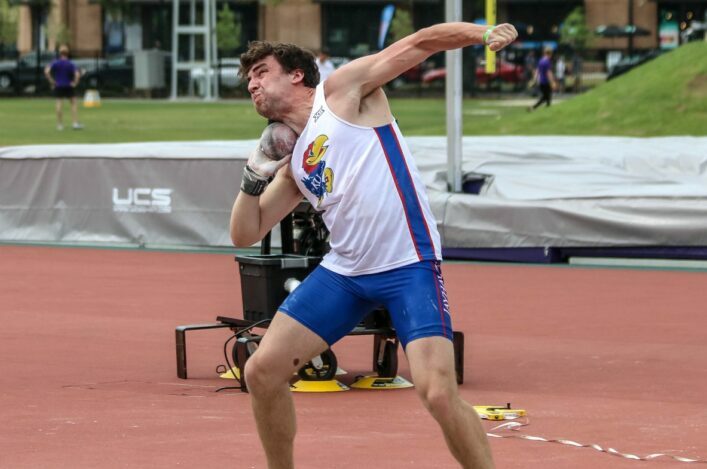 The event, which had earlier in the week set a new entry record for the fourth successive year, saw both the Men’s and Women’s champions eclipse previous marks with superb running on a still Easter Sunday morning. And there was also a World Best at W55, subject to ratification, for Fiona Matheson of Falkirk Vics. 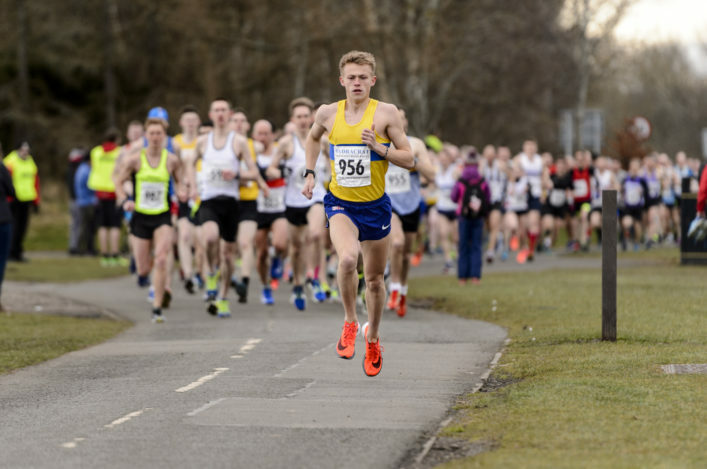 GB international Traynor bettered the existing course record to win the Tom Scott 10 Mile, Scottish Championships and West District Championships in a time of 47:59 mins. Fresh from his exploits last weekend at the World Half Marathon Championships in Valencia, the Giffnock North athlete established a gap from the start which he built over the next 10 miles to finish well clear in first place. Runner-up was Kenny Wilson of Moray Road Runners (49:43 mins), improving on his showing of fourth place from 12 months ago and claiming a first individual award at the event. Dermot Cummins, who placed 3rd at the 10 Mile event in 2013 and was returning to the event for the first time since 2014, was some 16 seconds behind Wilson in a time of 49:59. The prizes for 2nd and 3rd in the West District 10 Mile Championship were awarded to Stephen Trainer of Greenock Glenpark Harriers (50:37) and Stuart Gibson of Cambuslang (51:56). Inglis arrived as one of the favourites in the Women’s race and claimed the 10 Mile titles in another course record of 55:34 mins, a 16-second improvement on the time set by Fionnuala Ross two years ago. The Lothian RC athlete has competed in Canada and the USA in recent months. Crossing the line in second place was Mhairi Maclennan of Inverness Harriers in a time of 56:31. Maclennan, the Lindsays National XC champion in February, was making her first appearance in the 10-Mile race and finished clear of last year’s Scottish 5k champion, Annabel Simpson of Fife AC (57:52). The medals for first in the Women’s West District 10 Mile Championship was awarded to last year’s overall 10 Mile champion Katie White of Garscube Harriers (59:22), with second place going to Lindsey Currie of Dumbarton AAC (62:51) and Claire Thompson of Victoria Park City of Glasgow (63:01) earning third place. The Scottish Men’s Masters title was awarded for the first time to Leon Johnson of Edinburgh AC (54:03), who edged Darran Muir of Law & District (54:10) and the 2007 Tom Scott 10 Mile champion David Millar of Irvine Running Club (54:21) in an extremely tight battle. 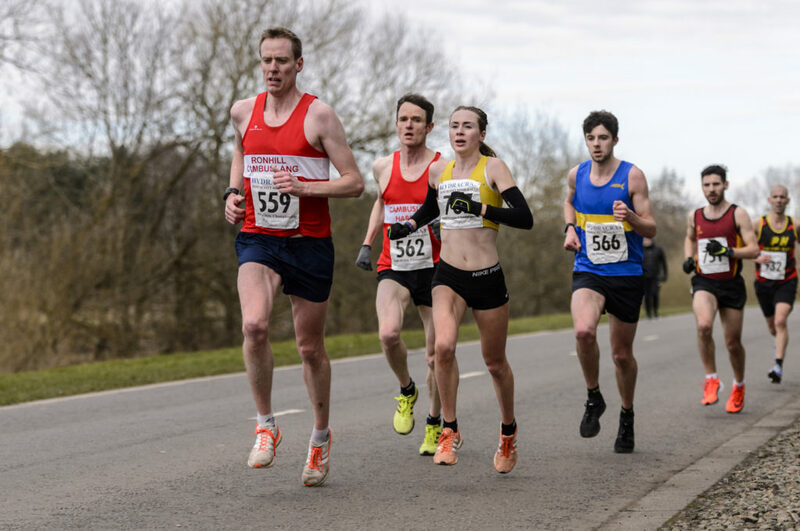 The Scottish Women’s Masters title was won by two-time Tom Scott 10 Mile champion Fiona Matheson of Falkirk Victoria Harriers (61:44) who was some 67 seconds ahead of Currie and Thompson. *And it has now emerged that Fiona’s time of 61.44 for the Tom Scott Road Races course is a W55 UK Best and a World Best for the 10-Mile distance. American athlete, Rae Baymiller, had held the global honour for some 20 years with a run of 62.39 set back in 1998. Many congratulations to Fiona on yet another world-class performance to and continuing to be an inspiration to athletes of all ages in Scotland ! Titles are also awarded to the 1st placed teams in the 10 Mile race with two coveted shields awarded to the winning clubs. The Motherwell YMCA Trophy for the first male team was awarded to Corstorphine AAC thanks to Dermot Cummins, Dougie Selman (5th male) and Alastair Brockie (22nd male). Fife AC took the silvers and Edinburgh AC the bronzes. The Anna Poulton Trophy for the victorious women’s team was awarded to Fife AC, as Annabel Simpson combined with Sheena Logan (6th female) and Alison McGill (7th female). Edinburgh AC and Garscube Harriers took the other medals. 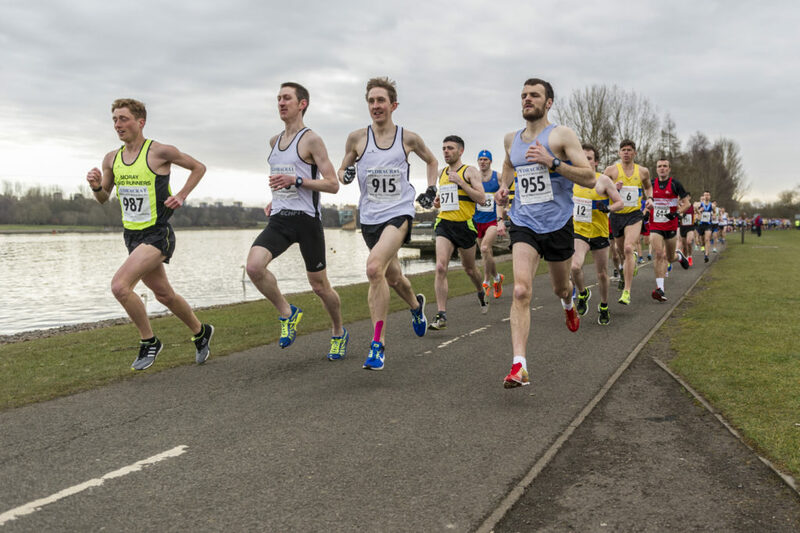 Giffnock North AC enjoyed further success in the Round the Loch 6k as Andrew Bonner was victorious in a time of 20:36, ahead of team mate Andrew Clark (20:43) and Aidan McCaffrey of Cumbernauld (20:52). There was success for Lesley Chisholm of Garscube Harriers in the women’s race in 22:20, ahead of Heather Addison of East Kilbride and Jessica Robson of Law & District. 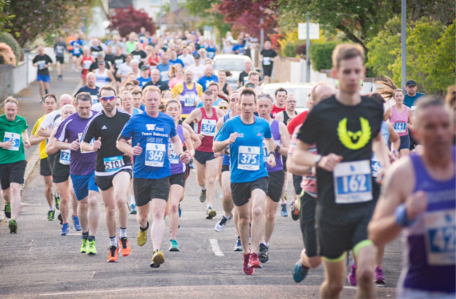 *The Tom Scott Memorial Road Races would like to thank all the athletes, volunteers, spectators and officials who all played a vital role in making the day such an enjoyable and successful occasion. The organisers would also like to thank main sponsor Hydracrat for their continued support and assistance in the organisation of the event. The Road Races would also like to thank Co-Op Funeralcare and Tunnocks for the provision of supplies at the finish area, ensuring athletes were provided with race supplies on the day. A final thanks to StuWeb, scottishathletics, St Andrews First Aid, and finally to the Strathclyde Park staff for all working to benefit the running of the event.